The economic vitality of our town and region is enhanced by the ability of Springfield to attract events and attention to the MassMutual Center. Once again the Birthplace of Basketball is the site of the NCAA D2 Men's Basketball Elite Eight tournament beginning with quarterfinal action on Wednesday and culminating in the national championship game on Saturday, March 29th at 2:30pm. Last year's tournament was very exciting with three games ending with last second shots to win. Though the schools involved are not household names, the quality of play is very good. Massachusetts' own Bentley College has made it to Springfield and will play its quarterfinal game on Wednesday night at 6:00pm against the University of North Alabama at the MassMutual Center. Tickets are inexpensive and the matchup promises to be a good one. I am a volunteer host for the host committee. This year I will be hosting the Augusta State University Jaguars, whose quarterfinal game is Wednesday afternoon against the University of Central Oklahoma. Fourth grade classes around the region, have followed the teams through the tournament. Schools in each town focused on one of the eight regions. Longmeadow fourth graders followed the South Atlantic teams. The South Atlantic region champs, Augusta State, will be meeting with these fourth graders at the Hall of Fame on Monday night for a brief rally and a "meet and greet." If you have a fourth grader who wants to come to this event but does not have the information, email me at jeroldduquette@comcast.net for details. The host committee does a great job of creating family friendly events all week. For example,the D2 FAN FEST, an interactive and exciting event aimed at youngsters will be happening on Saturday, March 29th at 10am before the final game. For information about other events open to the public contact the Hall of Fame. Let's show these teams and fans coming from as far away as Alaska that our region appreciates their efforts and their contribution to our local economy. Last night’s Select board meeting, which drew a large crowd, did clear up some nagging questions. First, the members of the board who voted to approve the override proposal (which passed the Select board by a vote of 3-2) confirmed that they did so with the understanding that it committed the Select board to level service budgets. Dr. Grady’s claims to the contrary were convincingly refuted. In addition, the Chair, Mr. Haberman, indicated that he recalled making this commitment clear to both the board and the Town Manager. Second, the support of the Select board for fully finding the school’s level-service budget was made quite clear. Only Kathy Grady voted against the schools. Her rationale was quite revealing. She claimed that the failure of the school department to provide her with enough justification for a couple of expenditures made her incapable of supporting the schools. The implication; the schools are hiding something from Dr. Grady. The exhaustive and very transparent school budget process as well as the support of all four other Select board members did not appear to impact Dr. Grady’s view of the schools. 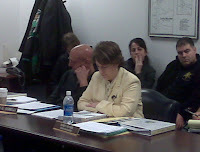 Sadly, she also made very clear that she sees the town and schools as adversaries, not partners. 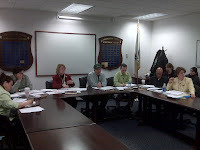 Third, The Town Manager interpreted the admittedly complex concept of “level service” budgeting very creatively. The town v. schools mentality was in full view as the Town Manager and Dr. Grady repeatedly referred to new SPED positions, implying that they were violations of the “level service” approach. Their indictment of our special education spending was part of their efforts to defend more than $200,000 in new non-education spending recommendations. All but one of those recommended spending increases was cut by the Select board last night. So, the good news is that 4 out of 5 members of the Select board came to work last night with the interests of the whole town in mind. The very precarious financial position of Longmeadow (as well as most small towns in the state) makes it even more important that we reject the division of our town into school and town hall camps. Unfortunately, it appears that this counter-productive perspective found its way into the Town Manager’s recommended budget. Last night the Select board firmly rejected this approach and that is very good news for all of the town’s residents. We often hear from critics of the public schools that their expenditures are out of control. We get unsolicited advice that school committees should rein in spending and learn to live with a budget. Longmeadow public schools are in the process of preparing their budgets and the amounts of money requested are precipitating a major controversy. How much should the schools be allowed to spend? How much should the non-school portion of the local budget be allowed to spend? These debates and arguments are not taking place in isolation. Almost all other budget making bodies in our area are experiencing the same things. Consider, if you will, the recent Republican story on local college expenditures and tuition increases. Here is an excerpt. NORTHAMPTON - It might not yet be in the same category with death and taxes, but it seems that college students can count on a tuition increase just about every year. Smith College announced this week that its comprehensive fee, which combines tuition, a study activities fee and room and board, will go up 5.5 percent next year, from $45,606 to $48,108. The college's board of trustees approved the hike at its March meeting. It marked at least the 10th consecutive year that the price of an education at Smith has gone up, according to Laurie B. Fenlason, the director of Smith's Office of College Relations. The average increase over that time has been 5 percent, Fenlason noted. Tuition hikes are also in the works for next year at a number of area colleges, including Mount Holyoke College, American International College and the University of Massachusetts. Fenlason said that colleges have many of the same problems that municipalities face, such as rising salaries, utility costs and the spiraling health care expenses. While cities and towns either cut services or raise taxes, colleges pass the costs on to students and their families. Elms College has not yet formally announced any increases for the 2008-2009 school year, although its board of trustees has voted to raise both fees and tuition, according to Director of Admissions Joseph P. Wagner. A letter specifying the increases has been sent to students and the college community. The current tuition is $22,590. Room and board is $8,820. Combined tuition, room and board next year at American International College in Springfield will go up 6.2 percent over this year. Peter J. Miller, vice president for admissions services for the college, said the increase will help defray costs of the new computerized student information system for grading, course selection, and the new telephone system, as well as pay for increased energy costs. The Western New England College Board of Trustees has approved a 5.5 percent tuition increase for the next school year. The combined cost of tuition, fees, room and board will be $38,024. Approximately 90 percent of undergraduates receive some form of financial aid, including need-based and merit aid, according to college spokesman David Stawasz. Students with good grades can qualify for merit scholarships of between $9,000 and $14,500, Stawasz said. The education package at Springfield College is also going up. Combined tuition, fees and room and board at Springfield College will rise 5.97 percent next year to $34,680. John L. Mailhot, vice president for administration and finance at the college, said a significant portion of the operating budget goes to direct financial aid to students. I think this news item is important because it reveals that the private sector and not just the public sector is having problems providing the same level of services for next year with this year’s level of a budget. The free market is responding to energy price increases, medical insurance price increases and wage increases for skilled labor. My point is this. To guarantee level services to our students, the Longmeadow Public Schools will have to obtain more revenue. The colleges of the area are struggling with the same economic forces that we are. A level services budget is not the same thing as a level funded budget. To provide level services to our students will require more money. Source: The Republican, Saturday, 15 March 2008, page 1.